1st Place - Stacy Kesner - 430 pts. 2nd Place - Debbie Bruno - 405 pts. 3rd Place - Pat Murphy - 340 pts. 4th Place - Doris Lewis - 335 pts. 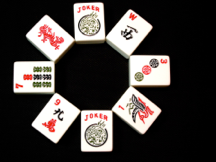 2019 NMJL Computer Card for "Shanghai 2nd Dynasty" and " Shanghai Mah Jongg Essentials"